The Spring Air by Briody Dorado 5' Divan Bed incorporates super soft latex, Layers of Plush Polyester and a Luxurious Layer of Comfort Foam for Outstanding Comfort. Part of the Spring Air Infinity Collection of beds by Briody, the Latex featured in this model, which naturally occurs from the sap of Indonesian Hardwoods, is an organic material which helps provide an Unparalleled Sleeping Experience. Spring Air by Briody Dorado Divan Bed is available in a range of sizes, from single and double through to kings size and super king size models. Stocking a great range of Briody latex divan beds, at Dalzell's we would encourage you to come and view these great beds at our store located in Markethill close to Armagh and Newry. With Free Pillows, Free Delivery and Free Collection and Recycling of Your Old Bed when we deliver your new Briody latex bed, you'll get a great deal today at Dalzell's. Our Free Delivery Zone includes Northern Ireland, and Counties Dublin, Louth and Monaghan. 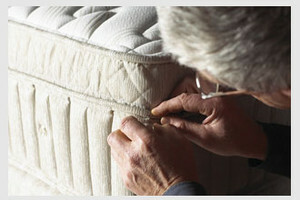 We’ll even remove & Dispose of Packaging and assemble your new divan bed in a room of your choice. With additional discounts for Multibuy, and our Price Promise. Call, email or visit in-store today.